Just time for a quick update this week. The main league news came from Finsbury Park where the Lakenheath Diamondbacks claimed a surprising sweep over the London Mets in the National Baseball League. The Mets were hoping to take advantage of the teams above them in the standings not being in action on Sunday, but Lakenheath had other ideas, improving their season record to 9-8 and showing that the Big Four of the season so far may have company in fighting for the playoff spots. 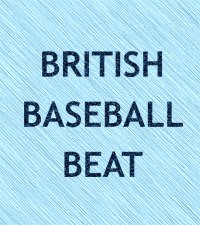 The Mets were without a few of their regulars as the Great Britain Baseball 23U National Team headed to New England for a six-game tour against teams from the Futures and New England Collegiate Baseball Leagues. The National Team programme also impacted on the other NBL meeting of the weekend as the Essex Arrows and Croydon Pirates followed their single league game – won by the Arrows 6-5 in extra innings – with a game each against the GB Juniors. It really is great to see the British league setup and the National programme coming together in this way to help develop young British talent and it’s a real credit to all involved, especially the coaches Liam Carroll and Will Lintern. Liam’s Twitter feed is arguably the best source for news on the 23U’s ‘Revolution’ tour, both for game updates and the inside track on how the tour is going overall. I’ll be back with a normal length BBB next Thursday, hopefully having watched some AAA-South action in a ‘varsity’-style match-up between the Cambridge Royals and Oxford Kings (weather permitting) at the former’s Coldham’s Common field. Hi Damien. Glad I mentioned it then! Thanks for the update. Hopefully I’ll be able to make it the following weekend (assuming it’s still being played in Cambridge?). It is currently billed to be played in Cambridge so provided nothing changes….